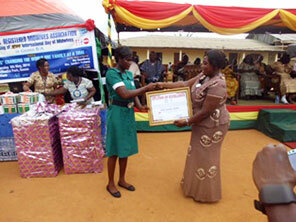 Raina Dizoal (left) receives her award from Ms. Georgina Afua Sam, the Regional Officer for Brong Ahafo Region for the Nursing and Midwifery Council of Ghana. Accra, Ghana—When Raina Dizoal finished her education at the Jirapa Midwifery Training School, she earned the distinction of being named best midwife to graduate from the Northern Sector—an honor she attributes in part to her clinical skills and time spent in the school’s refurbished lab. The 2013 graduate distinguished herself in a variety of subjects, from anatomy and physiology to maternal and child health. But this former community health nurse knew that the skills that would make a significant difference in her practice were the clinical ones. In Raina’s last semester, the U.S. Agency for International Development’s flagship Maternal and Child Health Integrated Program (MCHIP) refurbished and restocked the Training School’s skills lab with instruments and anatomic models. This initiative was part of its ongoing work to strengthen midwifery education in the country in partnership with the government of Ghana. Preceptors also were trained to assist students with skills practice on the ward, following theory and demonstrations by tutors. The new skills lab “contributed immensely to our studies, particularly the practicals,” said Raina, 30, who knew in high school that she wanted to be a health care provider. “We had instruments which you do not normally find on the wards. This enabled us to learn not only with standard equipment, but also to identify the equipment that would be a part of practical exams.” Until MCHIP arrived, Raina and other aspiring midwives were sharing an outdated lab with nursing students. Raina says the time spent in the MCHIP-refurbished lab also boosted her confidence in specific midwifery skills, including performing newborn resuscitation and using the Ambu bag to help the baby breathe, conducting a comprehensive examination of the newborn, and determining the position and line of the fetus. 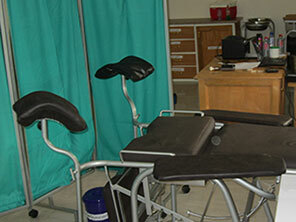 Refurbished skills lab at Jirapa Midwifery Training School. “These exceptional situations were possible because of the provision of skills labs in the midwifery school that I attended. It was equipped with instruments, simulation models and trained tutors and preceptors to support practice for competences,” she says. MCHIIP’s work to enhance quality improvement at all pre-service midwifery institutions began in 2010. Skills labs at 22 midwifery schools received a basic package of education tools and six skills labs, including Jirapa, were completely refurbished. More than 476 midwifery students have benefited from updated skills labs to enhance their abilities to perform and save the lives of Ghana’s mothers and babies, and future generations of students will continue to benefit. Raina was such an exceptional student and so proficient at her work that she is serving as second-in-charge at the health center where she works. The skills she learned in the refurbished lab continue to have an impact on her midwifery practice today as she advocates for ways to improve the quality of health services for Ghanaians.